When you take the time to vote this year, remember to take a moment and thank all the women who fought to give you the right to vote. It was not an easy battle. Those who fought for our right to vote lost so much. Equality was an alien term for the leaders during that time and sparked fear in those who could not handle change. As such, these Suffragettes were made to look crazy, never allowed to see their kids, had to hide from the law, lost their jobs and some even lost their lives. Yet, the women continued to fight, never giving into the popular archaic thoughts that infected the lives of society. The women looked to the future, to hope of equality. In recognition of their fight, Focus Features took this momentous event in history and created a film, inspired by true events, called Suffragette. 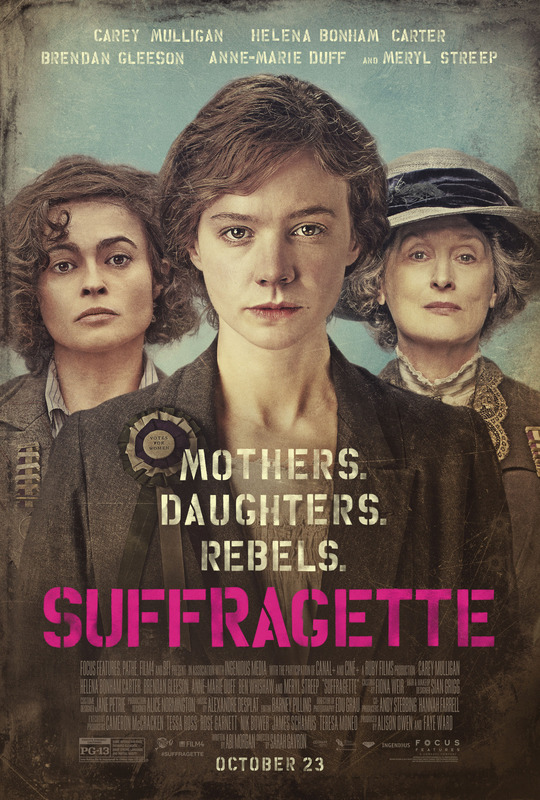 This heart-breaking and inspirational drama focuses on the real foot soldiers of the Suffragette movement and how they turned to violence as the only route to change. They were willing to lose everything in their fight for equality – their jobs, their homes, their children and their lives. I invite you to share posts on twitter, facebook, Instagram or whatever social media platform you prefer, regarding the theme featured each week for the “19 Days of Suffrage.” This is a great opportunity to remember the heroines in your life, the people who inspired you and what you are most thankful for. Week of 11/9: Talk about the heroines in your family that serve or have served in the Military. Week of 11/16: Who in your life inspired you? What does it means to you to be a woman in the world today? What fights have you won?. Being a woman today means girl power! We have so much more freedom than those before us. Being a woman today means that i have a lot more respect and freedom than those in history and still, we have a long way to go. Being a Woman in the World today is great, we have over come much over the years, with equal rights like men. One of the challenge’s I face today is having a Brain Tumor, it is not Cancerous but I have to constantly monitor it at the Doctors with test. The fights I have won are trying to feel and act normal with all my conditions. No one would ever look at me and know the challenges I face every day. I am a fighter and don’t give in or give up….. I just live, love and laugh and play hard and suffer silently later. I’m glad they have the right to vote. I’m a guy so I can’t really answer this question. We totally have to thank those women who came before us and led the way! I am an independent woman who has fought the battles needed to climb the ladder in my career!